It may be small, but it is not simple. Follow this little photo series documenting what it takes to carefully craft a custom fit watch band. Comment below and let me know what you want to see next! A template is made for the specific fit and style of the band. 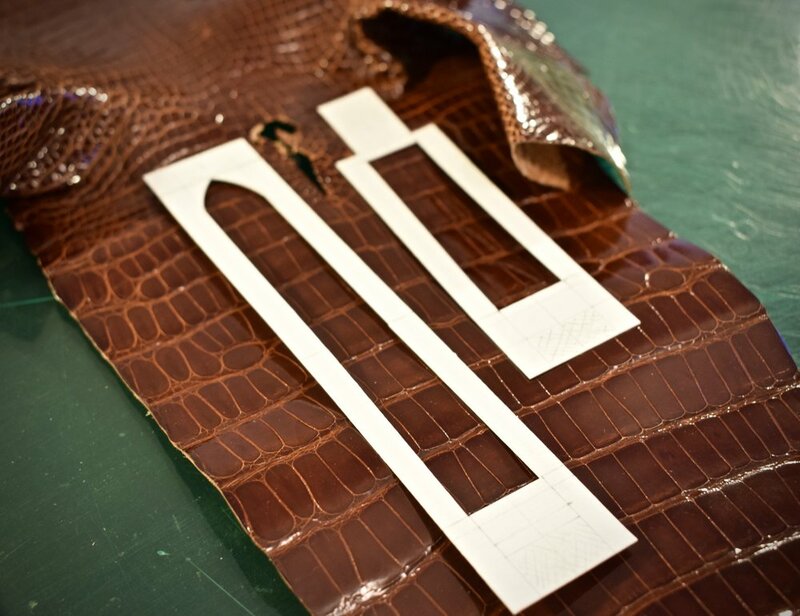 The window in the template allows me to make sure the scales are arranged well within the space. The padding inserts are shaved down to the desired shape after marking guidelines. This is a real “watch your fingers” step. The lining pieces are cut to match the original template. Cover pieces are cut and glued to the lining. Additional layers may be added for extra strength if necessary, depending on the leathers used. The insert is centered on the lining and positioned next to the spring bar. The cover piece is turned over and glued to the lining. The excess is trimmed away leaving the final watch band shape. Two keeper loops are prepared before the buckle side is completely glued in place. After hand stitching the pieces, several layers of edge paint are applied, sanded and smoothed. 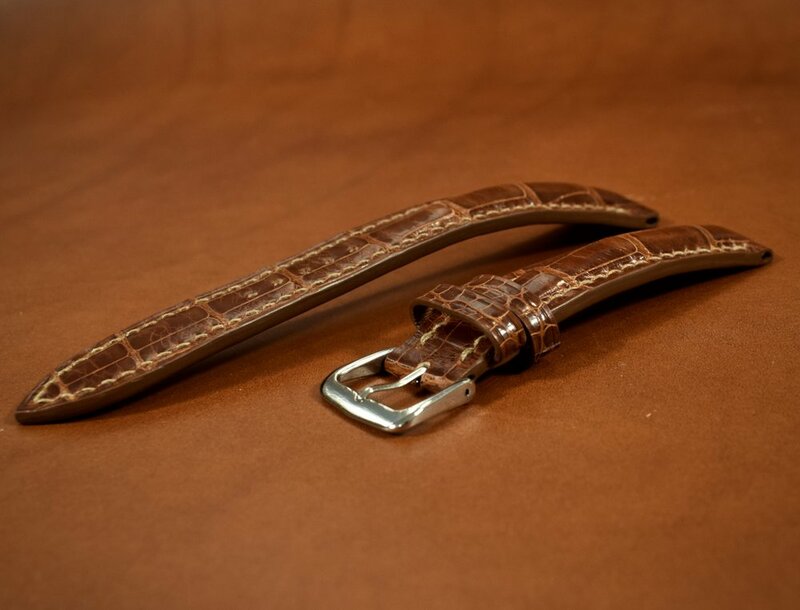 Finally, the buckle is attached and the holes are punched in the strap so that it makes the perfect fit for the customer. Compliments are difficult to accept as a perfectionist. While everyone else may see something they consider genuinely impressive, as the craftsman, it is hard to see past the what if’s and would be’s of all the little mistakes that I wish I could change. Accepting the idea of “good enough” was one of the hardest hurdles I had to clear when starting my business. To say I have ever given less than my best would be grossly inaccurate, but it took time to accept the fact that my best today is good enough, and tomorrow I can strive to be better. I’ll let you all in on a secret. For the longest time, I lived in constant fear that I would be found out. I was terrified that one of my pieces would fall apart and expose me as someone who really had no idea what they were doing. Without anyone to show me the way at each turn, I’ve more or less been fumbling through the dark, trying to figure out the right way to do things. Anyone that knows me can attest to how contrary to my personality and frustrating that is for me. But for the last two years, I’ve more or less been in an all out pursuit of mastering this craft as quickly as possible—almost as if trying to outrun my mistakes. It has been exceptionally difficult, but you’ll notice the difference in my work if you look back to what I produced just a year ago. So why on earth would I reveal this? I suppose I’m finally comfortable because my most recent project was the tipping point I was waiting for. I no longer feel like an imposter. In my opinion, the highest praise can only come from another respected craftsman—someone who really knows what they’re looking at. That finally came for me in the form of a watch band, requested by another maker. This particular maker shares with me the most unfortunate experience of losing their father all too soon. As I understand it, holding on to his old watch is one of the best ways she has to keep her father close. And while she is perfectly capable of making a replacement band herself, she trusted the task to me. If ever there has been a project at the heart of my business, this is it. The shift in my perspective has been tangible through this project, and I am extremely grateful to finally have confidence in my own abilities. By no stretch of the imagination am I perfect, but I’m finally good enough. I maintain my commitment to always strive to improve and look forward to seeing what I can do with this new confidence. One thing I think often that makes me smile: If you want to own the best piece I’ve ever made, order the next one. Comment below and let me know what you think, and share your big breakthrough moments. 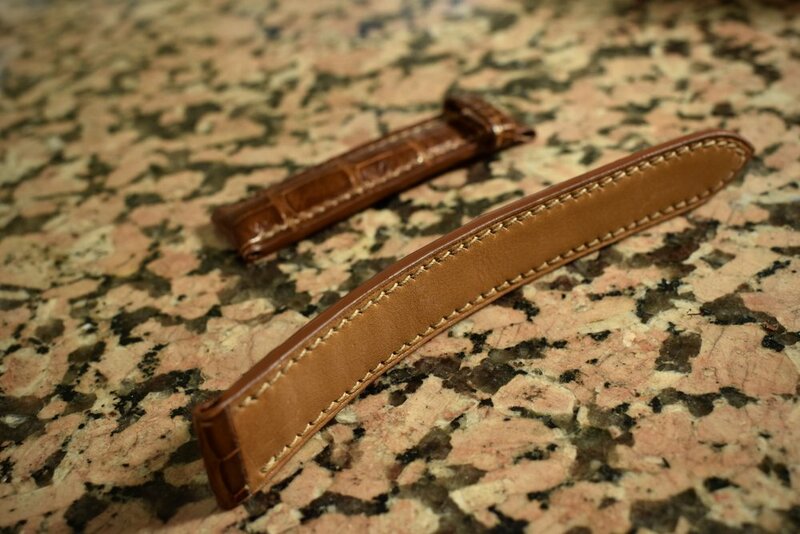 Stay tuned for my photoseries documenting the making of this watch band and go check out @afirecracker on instagram. She does some incredibly creative geometric animal designs. Don’t forget to get in those Christmas orders! Time is fast running out! I get it. The Halloween decorations aren't down yet and we haven't even gotten to Thanksgiving yet! It's too early to be thinking Christmas. But here in the world of handmade goods, I've been thinking Christmas rush since September. Time is quickly running out if you'd like to order something exceptional for that special someone. How can that be when Christmas is still nearly two months away? In order to guarantee everything arrives in time to be put under the tree before the 25th, dealing with the burdened postal system, I want to have every Christmas order finished and in the mail two weeks ahead of time. That's Dec. 11, which leaves only 5 full weeks for fulfilling orders. Depending on the type of order, it can take as little as a day to complete, or as much as a week. On average, I can complete 5 custom items in a week, so realistically there are only 20-25 spots available to guarantee your order. With each passing day that number will decrease, even if there aren't any orders because it is time lost. These spots will be given first come/ first serve, and I will stop accepting orders for Christmas at the end of the November. After Dec. 1st, all orders can expect a 2018 arrival, so there are only 4 weeks left to get in those orders. That really snuck up on you didn't it!? The nature of my business is difficult because it's really just me in my studio making everything completely by hand. There aren't any shortcuts. Quality takes time. So, even though I truly want to make sure everyone can place an order for the holidays, I simply cannot guarantee it. Last year I accepted orders as late as a week before Christmas simply because I launched my business mid-November. That put me in the position of working every waking moment to fulfill orders and hand delivering the last order on Christmas Eve. While I am willing to work 12+ hour days, I can't allow myself to be put in that situation again. So, while I understand it's too early to be thinking about Christmas, if ordering something from me was in the back of your mind, for your sake and mine, contact me as soon as possible to reserve your spot in line. I will do everything in my power to make sure you get something exceptional that your loved one will cherish for life. If I don't have the right thread or leather colors you were hoping for, I'm willing to order them just for you, but I have to have enough time to account for my supplier's Christmas rush. Unless you intend to purchase from my existing stock (which is a great option for fast turnaround) last-minute shopping is not an option. I hope to hear from you soon and begin hand crafting a gift that is sure to impress. Saddle stitching is a crucial part of the handmade process and takes years to master. The resulting diagonal stitch is functionally stronger than a machine stitch, and beautiful to admire. Follow along to see exactly what each of my hand-made items undergoes. Here it is, the fruition of months of random ideas, conversations alluding to a future website, and a few focused weeks of website building (and learning how to do so.) Welcome to my very own online storefront! This will be my new home for posting items that are available for purchase and accepting orders. So sit down, make yourself at home and get a feel for the place. Let me know what you think! If you're looking to buy something right now, that's ready to go, visit the "In Stock" section of the store. After I get a feel for what the most popular items are, I will try to keep small stocks available for immediate purchase. If you find something you like, just click "Add to Cart" and check out. I'll pop the item in the mail and you'll have it in short order. Does your taste not quite match up with anything in the "In Stock" section? Hop over to the "Made to Order" section to see all the potential items, color, and thread combinations. Fill out the request form associated with the item you'd like. Once I receive the request and payment, I'll set to work making it a reality. Unlike the "In Stock" section, these items will require extra time to make before they are shipped, so please allow at least 2-3 weeks. I'll communicate with you about the actual wait time once I receive the order, and I'll also try to keep the announcement bar up to date with current wait times, so you're not surprised. Finally, if you'd like any sort of custom item involving a name inscription or artistic design, you can submit a request using the form under the "Contact Me" section. You can also get to the form by visiting the "Custom Order" tab under the "Made to Order" heading. Hop over to my portfolio for examples of past custom items and see how limitless the possibilities are. Custom requests aren't limited to the items listed on the site, so feel free to ask away. Once I receive the request, I'll work closely with you to determine exactly what you want and I'll provide a price based on the level of customization and total time. This blog will be your source of up-to-date information on what new products will be coming to the store. I'll also be posting photos and descriptions of interesting projects I'm working on, and answering common leather work questions to give a peek behind the veil of how it's all made. For example, be on the lookout for giveaway opportunities in the next few weeks! Thanks for visiting, now don't be a stranger!